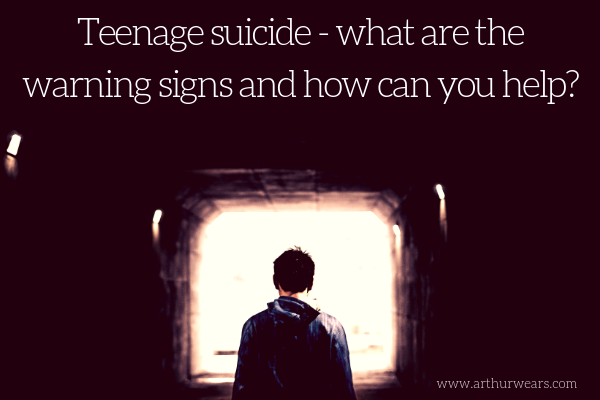 Arthurwears: Teenage suicide - what are the warning signs and how can you help? 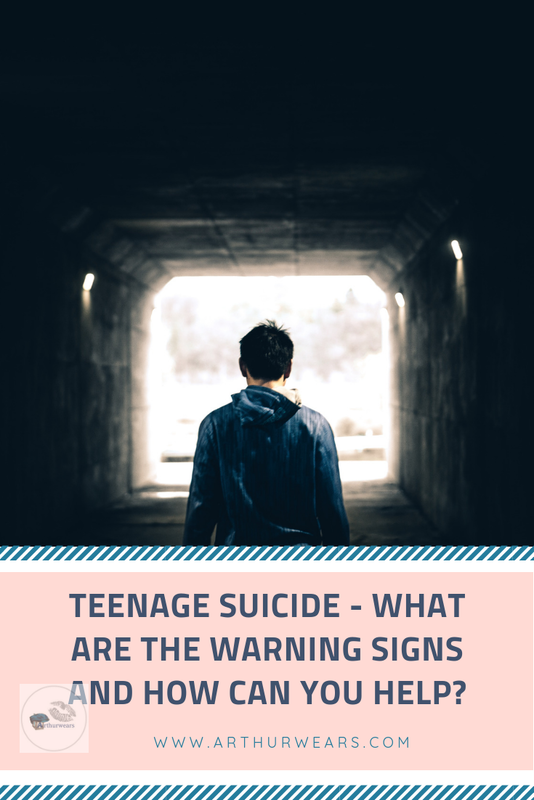 The number of teenage suicides in the UK has risen by 15% in the last year alone (office of national statistics - ONS) and depression is the biggest cause of ill health amongst teenagers around the world (BBC). We know that talking about mental health issues, although less of a 'taboo' topic these days thanks to campaigns such as #timetotalk and #worldmentalhealthday, can still be a tricky conversation to have. Some people worry that by opening up the conversation around suicide, they could be inadvertently putting the idea of suicide in their minds. The advice is still to talk openly and honestly about suicide, and research carried out by the charity for the prevention of young suicide, PAPYRUS , shows that talking about suicide does not give people ideas. Rather, you would be creating a scenario where you are making them aware that it is okay to talk about suicide and that there may be someone who can help. 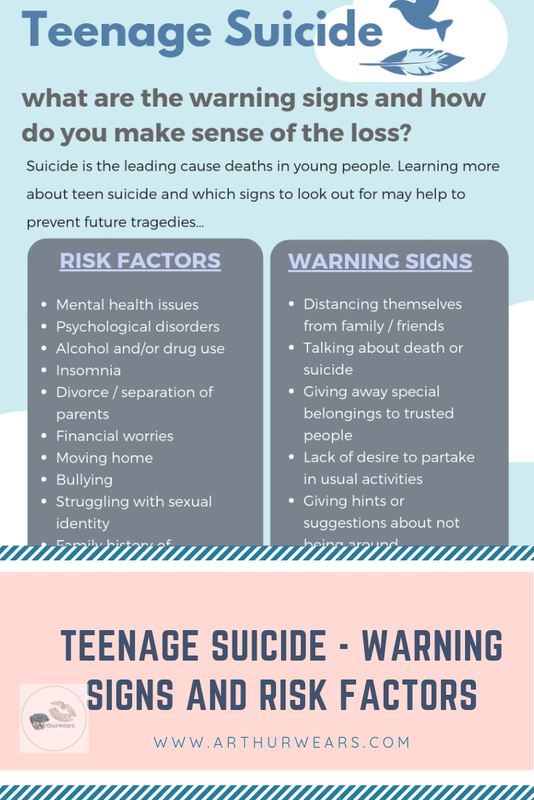 What are the warning signs of suicide risk? What should you look out for? 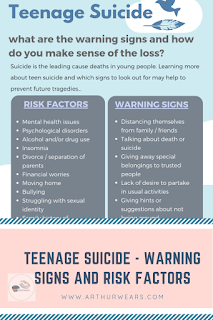 I have put together an infographic below which outlines some of the risk factors for teen suicide, some of the warning signs for suicide, places you can find help and also some information on coping with loss if you have found this page because of the death of a loved one. The end of the infographic includes a remembrance poem for those already passed. If you would like to support the fundraising cause in Quinn's memory for the 'If you care share' foundation, you can find all of the details on Quinn's fundraising page here. "The rest of those before us cannot settle the unrest of those to follow..."
Thank you though for sharing this. I have had issues with my eldest, who is 14, with him mentioning suicide to the school counsellor. I am thankful that he has a caring friend who took him to the counsellor to talk and that she in turn spoke to me. I had no idea how he was feeling. Thankfully this was a little while ago and he has improved since. I make an extra effort with him to talk about stuff and I hope it is working. Such an important issue. Thank you again. Mental health is a huge taboo subject, even though there is a lot more knowledge of everything around it's still very much kept secret. My daughter is 13 and my own mental health problems have had an affect on her. She struggles with anxiety. I am lucky in that she talks to me and her school are helping her with counselling and group sessions. More people need to be talking about mental health problems with teens as it is a big issue that needs highlighting. I’m so sorry you lost someone. Now this is something that many of us should be made aware of so th k you for being brave and sharing. Thank you for linking up with us for #kcacols and we hope to see you next time.